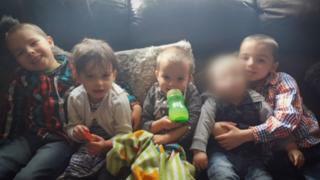 A man and a woman have been arrested on suspicion of manslaughter by gross negligence after four children died in a house fire.A 24-year-old woman and a 28-year-old man are in custody, Staffordshire Police said.Riley Holt, eight, Keegan Unitt, six, Tilly Rose Unitt, four, and Olly Unitt, three, died in the blaze in Highfields, Stafford, on Tuesday.The force urged people not to speculate on what may have happened.The children's 24-year-old mother, Natalie Unitt, and her 28-year-old partner, Chris Moulton, leapt from a first-floor window with the siblings' two-year-old brother, Jack. Staffordshire Police said: "This incident has had a huge impact on the community and we understand there will be confusion and a demand for information. "The cause of the fire is unknown and investigations are continuing.Staffordshire Fire and Rescue Service's deputy chief fire officer Rob Barber said: "Our work investigating the cause of the fire continues and we will make that public as soon as we are able." A JustGiving page for the family has raised Emotional tributes have been paid to the youngsters, with teachers describing them as "bright, happy, loving and lively".About 300 hundred people attended a candlelit vigil on Thursday where neighbours and friends walked with teddy bears and balloons to the scene.A spokeswoman for South Staffordshire Coroner's Court said the post-mortem examinations of the four children have not yet been completed but their file had been passed to the coroner.